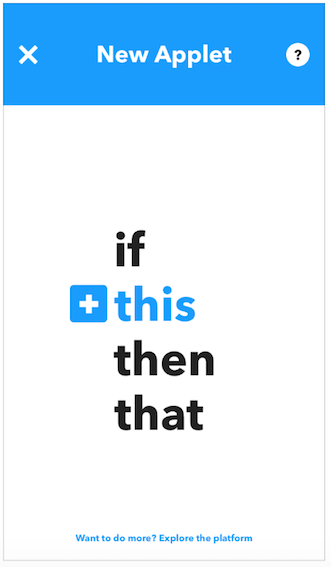 IFTTT ("If This Then That") is an automation provider that connects numerous smart devices and web services together. 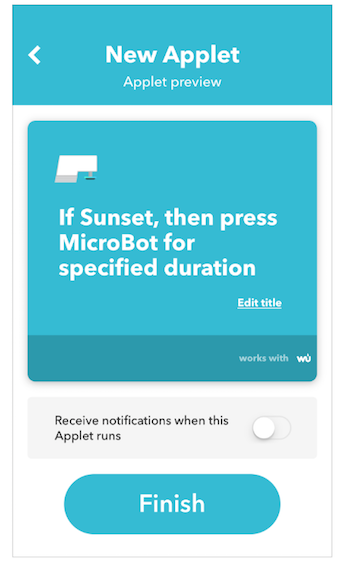 Using IFTTT, you can integrate your MicroBot with any device or service available on the platform and create automation workflows to make your home (or office) smart. 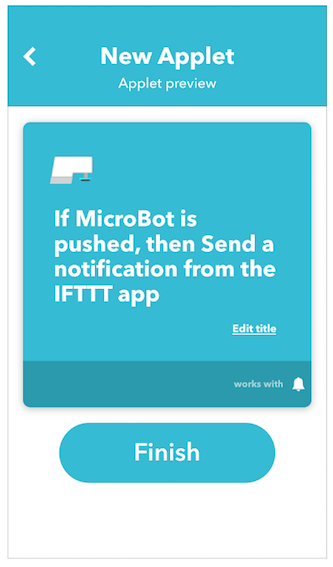 To use MicroBot Push with IFTTT, you need to enable the MicroBot Push service on IFTTT. Connect MicroBot Push's service. 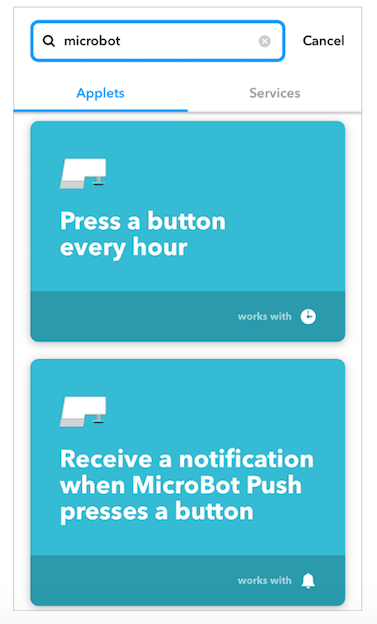 In the IFTTT app, search for 'MicroBot Push', tap on the 'MicroBot Push' icon and select 'Connect'. Note: The services 'MicroBot Push for Prota' and 'Prota' correspond to a previous version of MicroBot Push and MicroBot Hub. Please do not connect to these services. Principle. To set up an automation workflow, you need to create an applet. 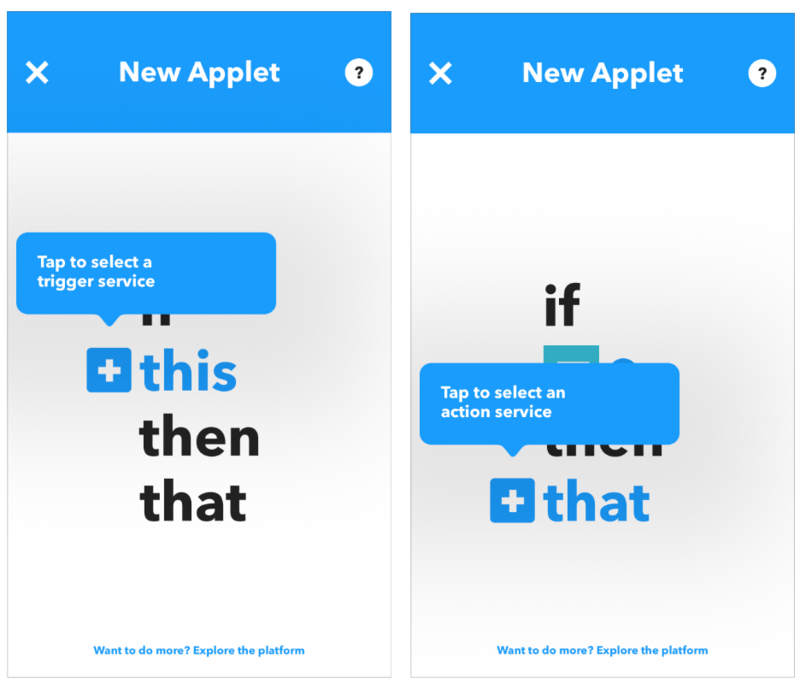 An applet is composed of a trigger (This) and an action (That) and follows the logic 'If this, then that'. Create an applet. Go to 'My Applets' and tap on '+'. Then, select the service and the event for your trigger ('this') and repeat the same for the action ('that'). 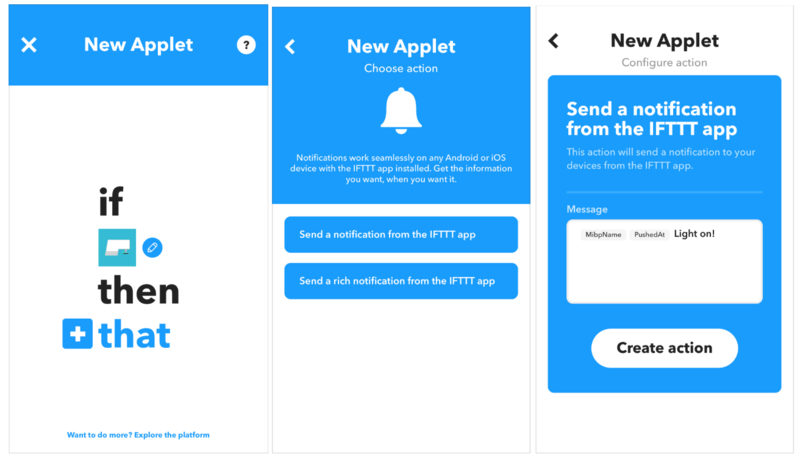 We've already created a set of applets for you to use. Other users may also share publicly their own applets. Search for applets. 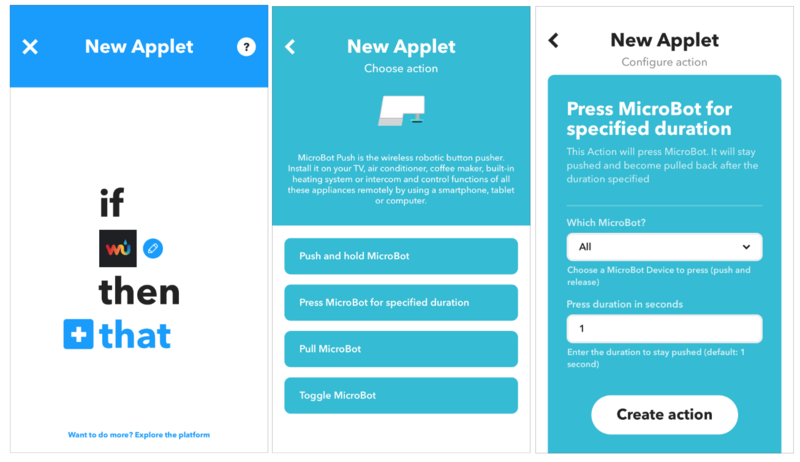 Use the search bar to discover applets or go to the page of MicroBot Push service to view all the applets that were created using MicroBot Push. Use a pre-defined applet. Select the applet, tap on 'Turn on' and fill in the required information. Then, save. Objective. Get a notification on your phone when MicroBot Push has turned the light on or off. 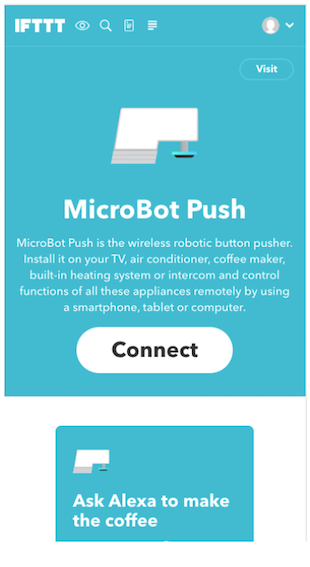 The MicroBot Push service and the Notifications service must be connected on IFTTT. MicroBot Push must be connected and working. Build the trigger. 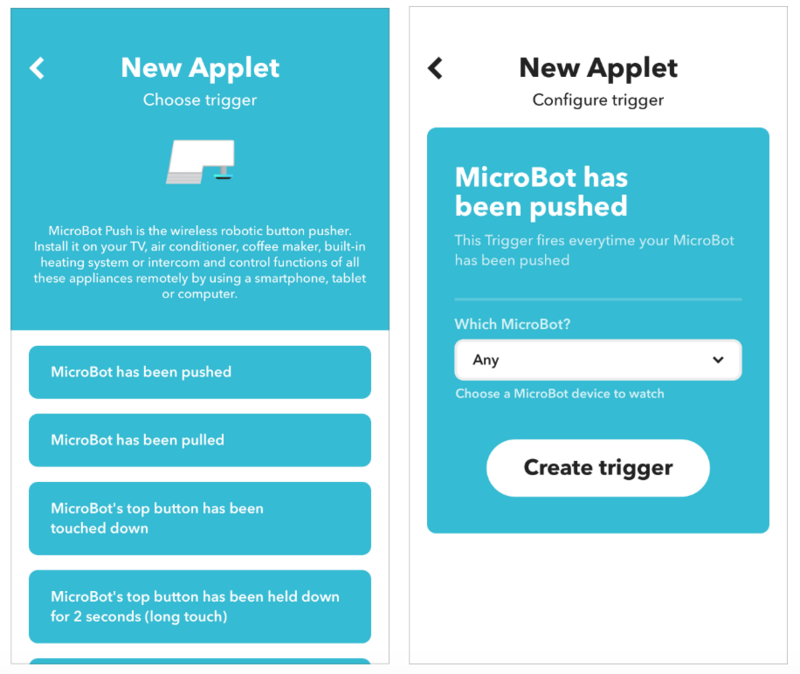 In the IFTTT app, tap on '+' to create a new applet, choose '+ this', and select 'MicroBot Push' and 'MicroBot Push has been pushed as the trigger'. Then, select your MicroBot and tap on 'Create trigger'. Build the action. Tap on '+ that', choose 'Notifications' and select 'send a notification'. Customize the text as you wish and tap on 'Create action'. Save the applet. Edit the applet's title if you wish and tap on 'Finish'. Objective. MicroBot Push turns on the light at sunset. Build the trigger. 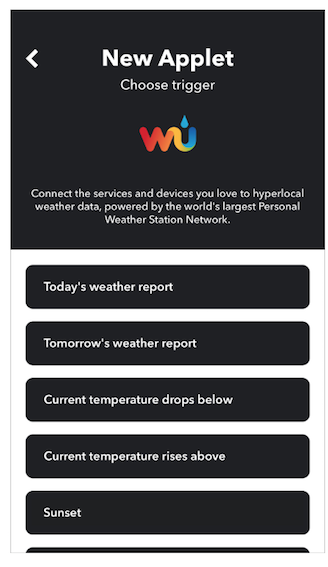 In the IFTTT app, tap on '+' to create a new applet, choose '+ this', and select 'Weather Underground' as the service. Then, select 'Sunset' as the trigger. Build the action. 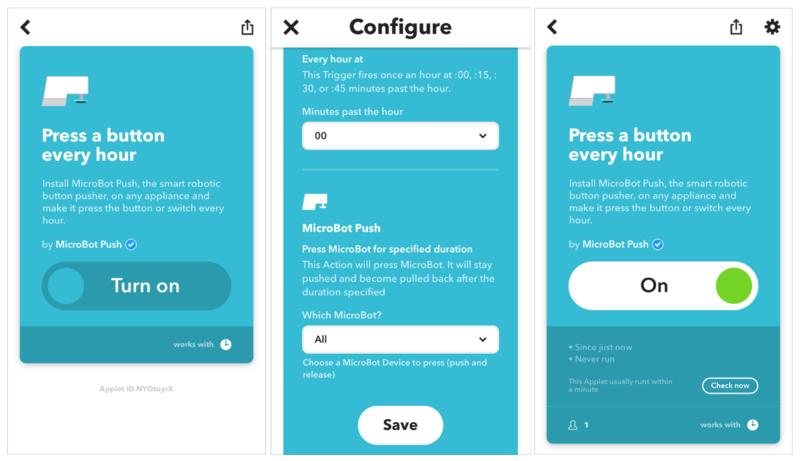 Tap on '+ that', select 'MicroBot Push' and select 'Press MicroBot for the specified duration'. Then, select your MicroBot Push and tap on 'Create action'. Note: You can choose whatever action that fits better your situation. For instance, if your MicroBot is installed on a toggle light switch and in toggle mode, choose 'Push and hold MicroBot' as the action.